Second Spurs Odyssey Quiz League launched! This is the first teaser to kick off our second Spurs Odyssey Quiz League competition. You get two points for identifying the former Tottenham player and a bonus point for naming the club he joined from Spurs. Email your answers, please, to SOQL1@normangillerbooks.com. Give your name, the district where you live and how long you�ve supported Spurs. I will respond, and will email a screen version of one of my Tottenham-themed books to the sender of the first all-correct answer drawn at random. 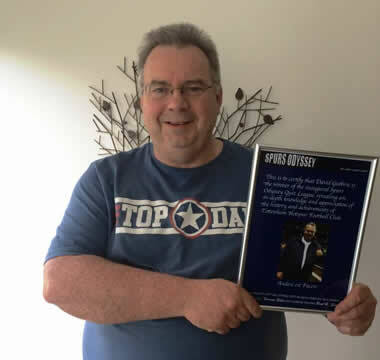 The photograph is being kindly supplied by Terry Baker, Jimmy�s manager who has visited him regularly after his recent severe stroke and reports that he is making slow but sure progress. We are all hoping that a home environment will help our hero. Join in the SOQL fun, and watch out for some special teasers later in the season that will really test your Tottenham knowledge. 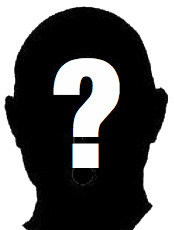 Last week�s Teaser: Who is the Geordie-born striker who scored 48 League goals for Spurs between 1995 and 2002, and with which Welsh club did he start and finish his career? Most of you were correct in naming Chris Armstrong, who did his best to fill the large boots of Jurgen Klinsmann, and started and finished his career with Wrexham. First name drawn at random from the correct answers is Jack Fairbairn, originally from Shoreditch and now in Gloucestershire. I will email a screen version of one of my Tottenham-themed books to Jack, who has been �a long-suffering Spurs fan� since the late 1960s. Long suffering, Jack, is part of the DNA for Tottenham supporters. There was surprisingly little to get excited about in Tottenham�s season opener at Old Trafford on Saturday. I did not envy our guru Paul Smith�s job of giving a running report on a match that lacked the urgency and full-throttle enthusiasm expected of the first game of a new campaign. Only the travelling Spurs supporters revealed total passion, and easily won the battle of the choirs with the Man United fans. I thought a draw would have been a fairer reflection of the action. Thinking positively, Spurs have still not conceded a goal by an opposition player. Walker�s unfortunate own goal would go down on any coroner�s report as accidental. There was a sluggishness about Spurs that suggested the midweek trip to Munich was hardly the best of preparations, but in fairness I would not have fancied charging around in what was oppressive heat. It�s easy to play the game from my sofa, but I would have melted out on the Old Trafford pitch. Where was the Manchester rain when we needed it? Football was not designed as a summer game. Tottenham have got one of the most dreaded away fixtures over and done with, and now Saturday�s home match against Stoke will give us a better idea of how cranked up they are for the season�s challenge. Anything but three points will be considered a failure against a physically powerful Stoke side well organised by Mark Hughes. I hope the gifted Dele Alli is allowed a proper chance to show that he is the player who can help Christian Eriksen give guile and style to the midfield. He did not get long enough to reveal his class when coming on as a late substitute against Man United. What a nightmare start to the season for Nabil Bentaleb, who played with the carelessness and clumsiness of an Australian batsman facing Stuart Broad. But he has not become a bad player overnight, and did not deserve the brutal battering he took from the never-ever-wrong couch coaches on line. He is still only 20, and remains rich with promise. It would be irresponsible and self-defeating if our own fans destroy the boy�s confidence with their over-the-top criticism. His No 1 fan Tim Sherwood would jump at the chance to have him at Villa Park. Two things screamed out at Old Trafford. Harry Kane needs support from a twin striker up front, and Tottenham have lost the blistering pace that used to come on the wings from the likes of Bale and Lennon. Over to you, Mr Levy. Time methinks to get the cheque book out if Mauricio Pochettino is to improve on last season�s fifth place in the table. Don�t let planning the new ground distract you from building a team fit for the old ground. There�s a long, long way to go � and we hope you take the journey with us here at Spurs Odyssey, the website that tries to be balanced and keep things in perspective. We do our crying in private. Ps on Bobby Soldado: I was a bit hasty in saying adios last week, but his situation is still up in the air. There could yet be major activity in the coming-and-going departments before the transfer window closes. They don�t call him Last-Minute-Levy for nothing. Pps A big thank you to our near neighbours for cheering us up with their opening performance of the season. I think it�s called Cech mate.